We get phone calls daily where clients ask us to design and print vehicle wraps, signs and banners. We can certainly "wrap" any vehicle and print signs and banners so that your business stands out from the competition. 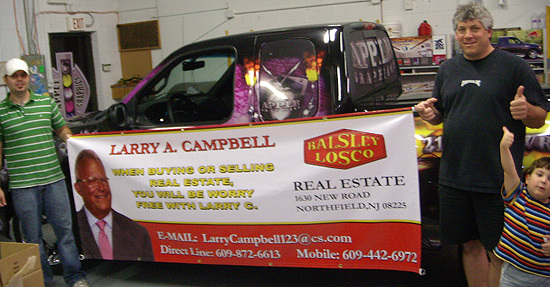 Two recent examples include a custom vehicle wrap for Michael Untermeyer, and a custom banner for Larry A. Campbell. Both came to us for a professional image that could be applied to their particular marketing need. Here are the photos and videos of each project just to show how each one was done. Full Vehicle Wrap for Michael Untermeyer for D.A. We are constantly improving our designs and fulfillment process to better serve our customers. Please contact us if you have a specific or a unique need for a sign, banner or vehicle wrap, we will be happy to hear from you.